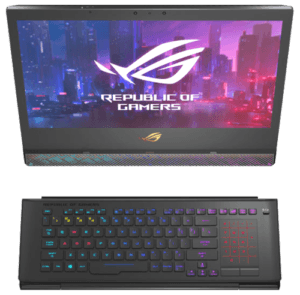 Asus just announced a whole bunch of gaming hardware and laptops the one of interest today is the RTX 2080 Asus ROG Mothership. The Mothership has a completely brand new design and concept of what portable computing and gaming could be. Instead of a traditional clamshell type of design, this one takes the way we open laptops and spins it on its head. The way you open this one is a bit different than what anyone has seen in the past. This Mothership opens in a completely bonkers way. It is similar to an all-in-one. You lay it on its front edge and a kickstand snaps out of the back of the display panel. Next, the keyboard entirely detaches from the device. The keyboard can be used wirelessly or wired. If it is wireless, it uses 1.4GHz radio frequency, and if its wored it uses a regular USB-C connection. The keystroke has a lot of travel in it with 2.4 mm. It doesn’t feel like a regular mechanical keyboard it’s still distinctly a laptop type of keyboard, but it’s very a tactile keyboard. The trackpad is located on the right-hand side of the keyboard. We have seen this before on the Zephyrus devices. You may not love its positioning, but the way it’s designed it pretty much required to be set up like this. The purpose of separating the keyboard in this kind of bizzar all-in-one design style to this portable device is for thermals. This device has the motherboard, CPU, GPU, and all of its components on the back of the screen. By positioning the internals there they are able to vent out the heat directly at the top and the sides of the device. While it’s venting it’s also drawing in cool air from behind the screen. You end up with a very impressive thermal solution. This guy is running the RTX 2080 and that the full, fat non-MaxQ version. As of this year, it’s the most powerful GPU we’ve seen from NVIDIA, and it’s running on a 17″ 144 Hertz G-sync enabled display. A product like ROG Mothership obviously isn’t for everyone. Not even most gamers are going to want something like this and it’s going to be super expensive once they release the final version. Since we only have our hands on a design sample, it looks really well engineered and well-built. As mentioned, it has an NVIDIA RTX 2080, an i9-8950HK and it weighs a bit over 10-pounds. With these specs, it’s supposed to rival the performance of most gaming desktops. At 10+ pounds it’s not super portable, and it’s definitely heavier than most gaming laptops, but it’s incredibly powerful and it’s portable. You can obviously carry this device around if you wanted to. 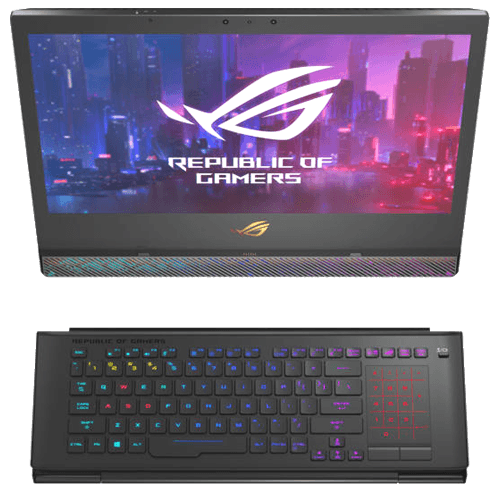 It’s well-built, it looks good, the thermal solutions are seemingly perfect, it rivals a desktop rig, and that’s the Asus ROG Mothership. Stay tuned as we learn more about this product after launch. It may be a good time to sell laptop that’s getting outdated and buy a new one. Not necessarily the Mothership though.